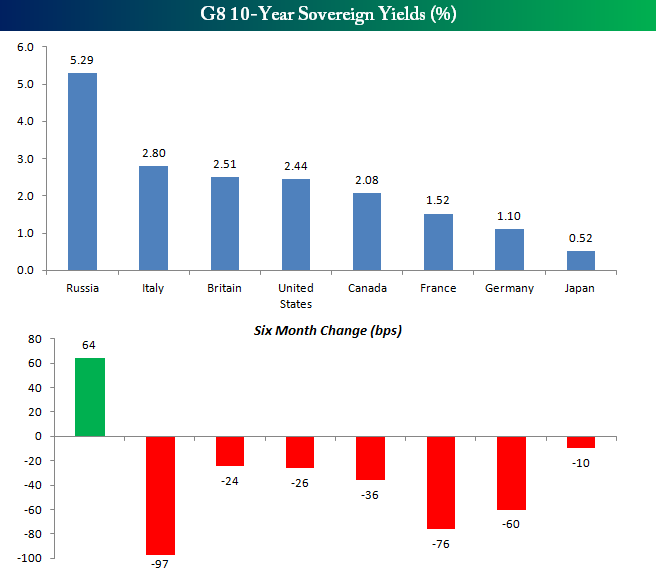 The chart below shows the 10 year government bond yields for the G8 countries. They have priced in perfection over the next decade within their public bond markets. I could write an endless amount of information on each of the markets above. Most are sitting at dangerously low yield levels and in some cases all time historically low yield levels. Japan represents is the greatest danger, by far (see Japan Is A Powder Keg Searching For A Match). I believe bond holders in 6 of the 8 countries above will all experience major losses in the decade ahead. I think Canadian bond buyers will most likely be hurt less than the others. Russia is the one G8 market where prices are close to the point where I am very interested in purchasing shorter duration bonds denominated in Russian currency (a discussion for another day). The German 10 year touched 1.06% during the week after data showed the recovery in Europe has stalled across the region. German 2 year bunds (Germany's government bonds) went negative for a brief period this week; meaning that investors were paying the German government to hold their money over the next two years. German factory orders and industrial production unexpectedly went negative this week, but the real weakness in Europe came from Italy who triple dipped into recession. 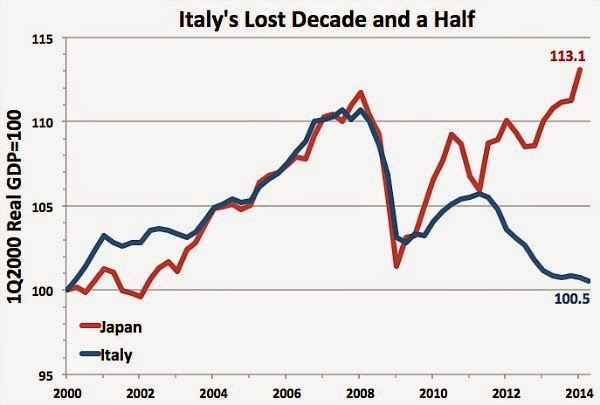 Italy has now wiped out all its growth since 2000. The weakness across Europe has investors scrambling out of risk assets into the safety of German bonds. The DAX index (German stocks) crossed below its 200 day moving average this week after giving up 1000 points in just a few days. "On the subject of junk debt, in the first two quarters of 2014, European high yield bond issuance outstripped U.S. issuance for the first time in history, with 77% of the total represented by Greece, Ireland, Italy, Portugal, and Spain. This issuance has been enabled by the “reach for yield” provoked by zero interest rate policy. The discomfort of investors with zero interest rates allows weak borrowers – in the words of the Financial Times – “to harness strong investor demand.” Meanwhile, Bloomberg reports that pension funds, squeezed for sources of safe return, have been abandoning their investment grade policies to invest in higher yielding junk bonds. 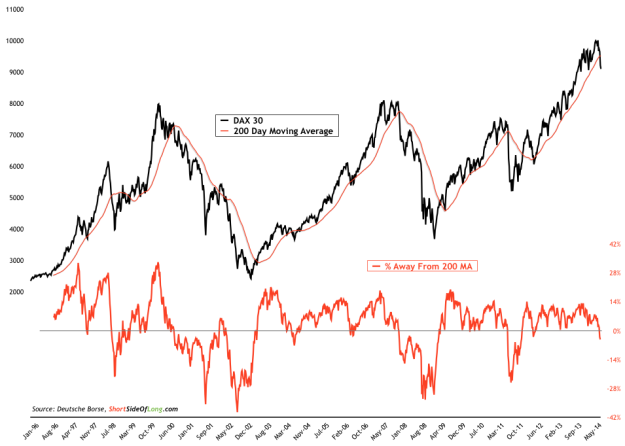 Rather than thinking in terms of valuation and risk, they are focused on the carry they hope to earn because the default environment seems "benign" at the moment. This is just the housing bubble replicated in a different class of securities. It will end badly." European public debt rose from 130% of GDP in Q1 2013 to 135.6% of GDP in Q1 of this year. It is expected to cross 140% of GDP by the first part of next year. The fundamentals continue to weaken as bond prices continue to surge higher. There will be an inflection point coming, it is only a matter of when.